The northern cardinal is one of the most popular birds in North America, but how much do you really know about these jaunty, colorful birds? There is a lot more to cardinals than pretty plumage! The northern cardinal (Cardinalis cardinalis) is also called the common cardinal, redbird, and Virginia nightingale. Because these birds are so familiar and easily recognizable, they are often just called cardinals rather than their full name, northern cardinals. These songbirds belong to the Cardinalidae family, but only one other cardinal species–the vermilion cardinal–is also in the family. Other birds called cardinals, such as the yellow-billed cardinal, red-crested cardinal, and masked cardinal belong to the Thraupidae family, while the yellow cardinal is a member of the Emberizidae family. Northern cardinals are named for the males' brilliant red plumage, which reminded European settlers of the rich red vestments of Catholic cardinals. The bird's crest is also reminiscent of the headgear of some higher religious officials. 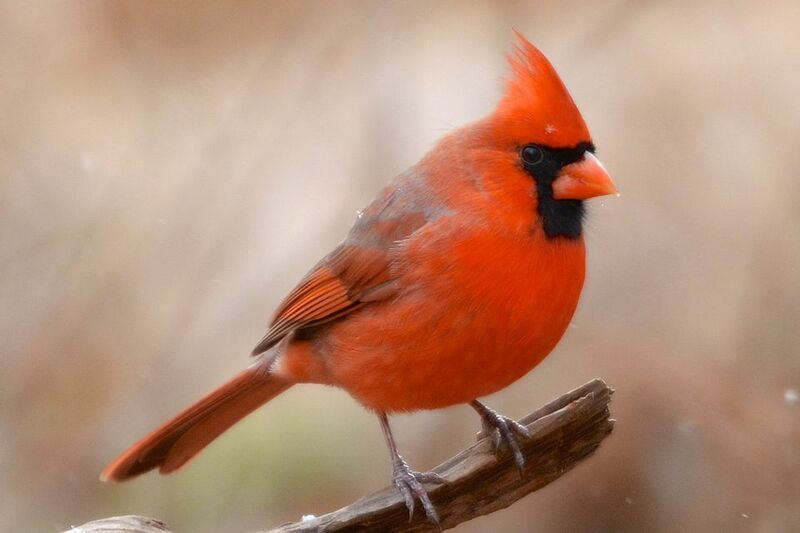 The red coloration of northern cardinals' plumage is a result of carotenoids in their feather structure, and they ingest those carotenoids through their diet. On rare occasions, vibrant yellow northern cardinals may be seen, a genetic plumage variation called xanthochroism. These are dimorphic birds, and while the red males are instantly recognizable, the more camouflaged females are also lovely and elegant. Female cardinals are a soft, warm tan color with a bright orange bill and red edging to the wings and tail. Both male and female northern cardinals are adept songsters, and they may sing year-round. Females often sing while sitting on the nest, which may communicate the need for more food to their mates. Females also often have more elaborate songs than males. One cardinal may have more than two dozen song variations, and different geographic populations often have quite different songs. These are monogamous birds that may mate for life. If the pair is able to produce healthy offspring, they may remain together for some time, though cardinals will divorce if necessary to find a more suitable mate. A mated pair is often seen feeding together, with the male gently offering a seed to his mate in a kiss-like gesture. Cardinal pairs remain together year-round and join with other northern cardinals to form large flocks in the winter, making a stunning sight when a large group of these birds is spotted in a snowy landscape. A flock of cardinals can be called a college, conclave, radiance, or Vatican. Northern cardinals occasionally go bald, losing all the feathers on their heads and showing black or dark gray skin instead. It can be a startling appearance but is a natural part of their molting cycle. In some cases, mite or parasite infestations can contribute to this temporary baldness, but the feathers will eventually regrow. There are more than a dozen northern cardinal subspecies, though only four subspecies are typically recorded north of Mexico. All the subspecies are instantly recognizable as cardinals, but there are subtle variations in overall size, crest size, and color intensity. These are granivorous birds that use their large, powerful bills to crack a variety of different seeds. They also eat fruits, berries, insects, and grains, allowing them to forage for different foods as seasons change. Northern cardinals are found throughout much of the eastern, central, southern, and southwestern United States, as well as in eastern Mexico and as far south as Guatemala and Belize. This makes the species the northernmost of the cardinal species, most of which are tropical birds. Northern cardinals do not migrate. Thanks to bird-friendly urban and suburban landscaping and these birds' adaptability, the northern cardinal's range is expanding in many areas, including to the north and west. There is some habitat loss and associated population declines in the extreme southwestern part of their range, however. These can be aggressive birds that violently defend their territories, and males will chase away competitors. Cardinals will also attack their reflections in mirrors, windows, chrome bumpers, and other reflective surfaces, often spending hours attacking what they perceive as unwelcome intruders. Northern cardinals have been honored as the official state bird of seven different states, the most of any single bird species. Illinois, Indiana, Kentucky, North Carolina, Ohio, Virginia, and West Virginia have all designated the northern cardinal as their symbolic bird. These birds are popular mascots, not only for the St. Louis Cardinals baseball team and the Arizona Cardinals NFL team, but also for different schools. Lamar University in Texas, Ball State University in Indiana, the University of Louisville in Kentucky, Wesleyan University in Connecticut, and the State University of New York at Plattsburgh are all represented by the cardinals. Many other high schools, junior highs, and elementary schools also use cardinal mascots. While most northern cardinals live less than three years, the longest lifespan for a cardinal was recorded at over 15 years. Because these birds stay in the same territory year-round, a backyard birder might see the same individual cardinals visiting their feeders for years. In the 1800s, northern cardinals were popular as cage birds for their brilliant plumage and sweet songs. Bird poaching was a threat to cardinals, but, fortunately, they are now protected by the Migratory Bird Treaty Act and other legislation. Northern cardinals are easy to attract to bird-friendly yards, particularly where sunflower seeds and safflower seeds are available in large hopper feeders, open tray feeders, and ground feeding areas. They will also visit bird baths and roost in bushes and shrubbery. Because of their beauty, dedication to mates and musical songs, cardinals are one of the most popular species among birders and non-birders alike. Cardinal motifs can be found on many bird-themed gifts, including figurines, crafts, collectibles, and more, and they are popular on Christmas cards and for many winter decorations. We Bet You Didn't Know These Fun Facts About Ducks! Bird Trivia: Do You Know These Fun Facts About Roadrunners?